Sometimes we forget to be tourists in the places we live. Having visitors helps. On this occasion, we ventured into Ginza, headed for the Laduree Tea Room, but arrived too early and had to wait outside a bit before we could go in. The waiting was exceptional, as the day was clear and temperate and given to people-watching. 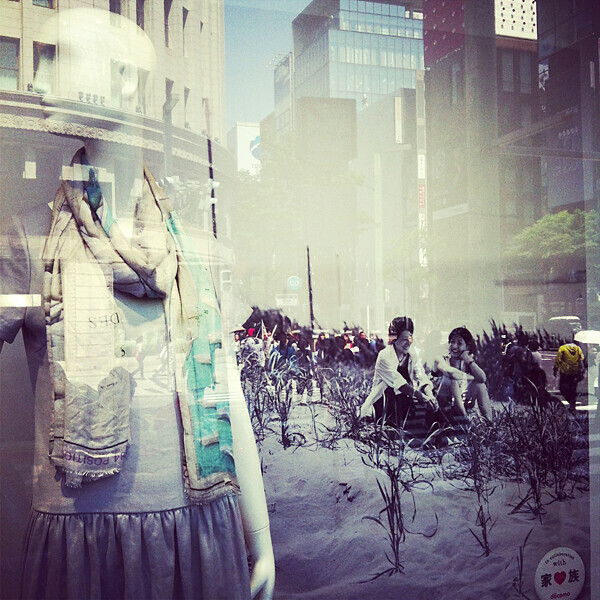 I took this photograph in the window of a department store. A line of brightly coloured pedestrians makes its way through the monochrome of sand-dune beach-brush, a black-and-white couple sits on steps imagined from the crosswalk zebra and a spectrum of silver sand spills out into the city streets under facades of glass and brick and the signage of the city while an icon of fashion turns the other cheek. Even as the spring becomes the summer, it’s all about the layers. This entry was posted in Instagram & Poladroid, Observational, Photography and tagged Advertisement, Crosswalk, Display, Fashion, Ginza, Instagram, Japan, Laduree, Layers, Reflections, Spring, Street, Summer, Tokyo, Window on May 5, 2014 by damienpitter.